Ryan Lynch remembers readjusting the cap on his head and focusing on the kid squaring up in the batter’s box 60 feet and 6 inches away. The catcher flashed a signal and Lynch gave a slight nod as the bright south Florida sun cast shadows across the field at JetBlue Park in Fort Myers Beach. It was a picture of precision, and Lynch recounted. As he wound up, his weight on his back foot, his arm whipped through its motion. Less than a second later, the ball that was once in his hand smacked into the catcher’s mitt, painting the bottom corner of the strike zone. Nearby, a man paying close attention to the game glanced down at his radar gun. The numbers flickered onto the screen: 87 miles per hour. Lynch has already experienced much success in his still-young athletic career. With his sophomore season not yet underway, the hard-throwing left-hander has already accepted an offer to play Division 1 college baseball at the University of Notre Dame, picking the Fighting Irish over offers from Indiana University, University of Louisville and Louisiana State University, among others. The baseball field isn’t the only place he’s excelled, though. Lynch is also the starting quarterback for the Penn High School Kingsmen football team that is currently competing for a state championship. Like many successful athletes, Lynch comes from a family full of them. His mother was a two-sport athlete in high school, playing basketball and softball, and his father played Division I Baseball at the University of Wisconsin. In fact, Ryan wasn’t the only one in the Lynch household competing for an IHSAA state championship this fall. His sister Kristina, a fellow Division 1 prospect committed to play soccer at Florida State University next year, led Penn to a second consecutive State Championship in Girls Soccer. The record-setting Kristina Lynch helped Penn finish the 2017 season as the National Champions. With a pedigree like this, Ryan Lynch’s athletic accomplishments shouldn’t come as a surprise. 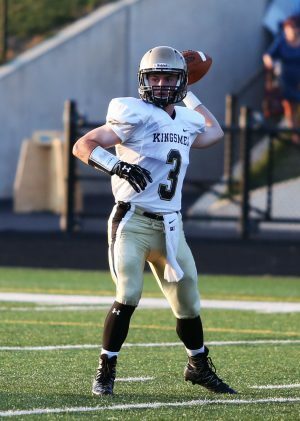 Ryan Lynch credits his sister’s experience in the recruiting process as one of the important factors that prepared him for his involvement in the process. “It was kind of exciting to watch her go through the process and seeing the different schools showing interest, and I couldn’t wait for that to start happening to me,” Ryan Lynch reflected. Getting the opportunity to play at a big-time college is the dream of many high school athletes. Navigating the recruiting process can be tricky, though. Lynch had his sister’s prior experience to rely on for advice when deciding where to play his college baseball. Ryan Lynch enjoyed an outstanding freshman season in Baseball. 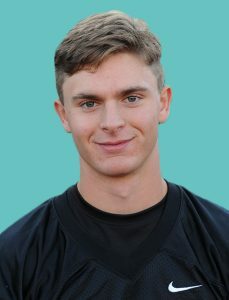 He finished with a perfect 7-0 record (including a no-hitter against Bremen High School) along with 64 strikeouts and a 2.86 ERA, Lynch made an impression on teammates and coaches alike. After a year like that, expectations are sky-high for Lynch in the upcoming baseball season. Off the field, Lynch is a good student who can often be found in the library before school. With this work ethic, it’s not hard to imagine him rising to or exceeding the expectations set for him this year. As for the football season, though the Lynch family already has one blue ring on the way, a second one would be readily welcomed.